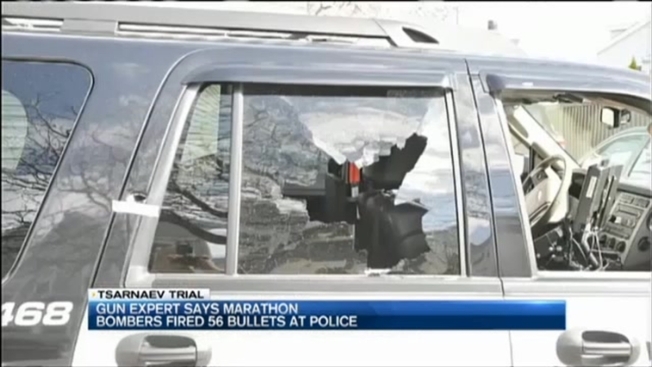 The Boston Marathon bombers fired 56 bullets at police during a violent confrontation days after the 2013 attack, a ballistics expert testified Tuesday during the federal death penalty trial of Dzhokhar Tsarnaev. State Police Lt. David Cahill said 56 shell casings from a 9mm, semi-automatic Ruger handgun were found at the scene of a battle in Watertown between Tsarnaev and his older brother, Tamerlan, and police April 19, 2013. The same Ruger gun had been used to kill Massachusetts Institute of Technology police Officer Sean Collier hours earlier, Cahill said. Police fired 210 bullets during the battle, the lieutenant said. Dzhokhar Tsarnaev's lawyers say it was Tamerlan who shot Collier and used the gun during the battle with police. Dzhokhar is charged in the bombings, in Collier's shooting and in the Watertown confrontation. Tamerlan, 26, died after the shootout. Three people were killed and more than 260 were injured in the marathon bombings. A close friend testified last week that he let Dzhokhar borrow the Ruger handgun about two months before the marathon bombings after Dzhokhar told him he wanted to rob some students from the University of Rhode Island. The friend, Stephen Silva, said he asked Dzhokhar repeatedly to return the gun to him, but he "kept coming up with excuses" for why he did not bring it back. Tsarnaev's lawyers have repeatedly referenced a pellet gun or air gun that was found at the scene of the Watertown shootout in an apparent attempt to suggest that he may have used a nonlethal gun during the fight. What Was on Tsarnaev's Laptop? Tsarnaev's lawyer admitted during opening statements that he participated in the bombings but said his brother Tamerlan was the mastermind and recruited the then 19-year-old Dzhokhar to help him. Dzhokhar, now 21, faces the possibility of the death penalty.